There are 25 krueng streams which lead to Laut Tawar lake with a total water discharge of approximately 10,043 liters per second. 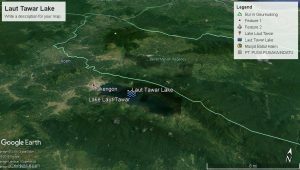 Flora in this lake, identified 46 types of plankton which are divided into 11 classes in Laut Tawar Lake, with details of Chlorophyceae class of 35%, Bacillariophyceae 24%, Myxophyceae 9%, and other classes at 32%. Hydrilla sp., Water hyacinth, and kiambang can also be found living on the edge of the lake. For fauna, Laut Tawar Lake is a natural habitat for Depik Fish(Rasbora Tawarensis). In addition, there were 3 types of mollusks, 1 type of annelida, 37 species of fish, and 49 species of insects that live in the Danau Laut Tawar area. For animals that live around the lake, 20 mammal species are divided into 13 families, some of which include protected animals, including binturung, pukas, pangolin, porcupine, mouse deer, sweepers, gibbons, siamang, tanado, tigers, jungle cats , deer, and deer….